In this week’s top stories: Tim Cook hints at a “can’t live without” feature for iPhone 7, we detail Apple Music’s upcoming redesign planned for iOS 10, and the latest round of iPhone 7 reports. 9to5Toys scours the net each day to bring our US readers the best deals in consumer electronics. Below are the absolute hottest deals going on right now. Most of these promotions are only available for a limited time, so be sure to lock in these savings if you see something you like. Check back often as we are constantly posting new deals. Also bookmark 9to5Toys.com/Daily-deals for 35+ of the top daily deals across most of the biggest shopping sites in the US including Amazon, Best Buy, Walmart, Target, and many more. Ending today: Best Buy is taking $125 off the price of MacBook Airs for the next three days to celebrate Mother’s Day. That yields some of the lowest prices we’ve seen. The retailler knocks off $100 across the board, then using code MOM25 knocks off another $25. Amazon has stepped up and is offering a staggering $150 off three out of four standard configuration iMacs (21″ & 27″). This discount is yielding the lowest prices we have ever seen on these super-skinny iMacs. Don’t wait too long to pull the trigger, this is an unadvertised sale that Amazon could pull the plug on at any moment. The current generation MacBook Air, iMac and Retina MacBook Pro do not include a CD/DVD optical drive, but you can pickup a discounted Apple Superdrive right now for just $69 (Reg. $79). Best Buy is taking $125 off the price of MacBook Airs for the next three days to celebrate Mother’s Day. That yields some of the lowest prices we’ve seen. The retailler knocks off $100 across the board, then using code MOM25 knocks off another $25. Best Buy is also offering a $100 iTunes gift cad for $85. (Free Money!) That is a total savings of 15% off future purchases of Apps Music, Movies and any other content on the the App Store, iTunes, Mac App Store and iBook Store. This is the first iTunes deal we’ve seen in nearly 2 months and a perfect opportunity to surprise Mom on Mother’s Day. Those interested in an iPhone 4S can pick one up for $50 (half off) with contract. Best Buy also offers probably the best looking keyboard case out there, Targus – Versavu Keyboard Case for Apple® iPad – Bone White half off for $50. Just a few weeks ago we saw an unprecedented sale from Best Buy on current generation iMacs and now Amazon has stepped up and surpassed that deal by offering a staggering $150 off 3 out 4 standard configuration iMacs. Just launched on the App Store in time for Mother’s Day, the Felt iPad app lets you create and send real handwritten cards directly from your iPad for a flat rate of $3.99 including shipping. It has competitors with Apple’s own Cards app ($4.99 per card), and the Inkly app, which lets you upload handwritten messages via a photo, but neither have found a way to integrate the handwritten aspect right in the iPad app like Felt. The slick interface shown in the video above allows you to easily handwrite not only the letter but also address the envelope by hand. Once your done the app handles the rest by sending out a real card printed on “premium Mohawk card stock and a kraft paper envelope” within 24 hours. 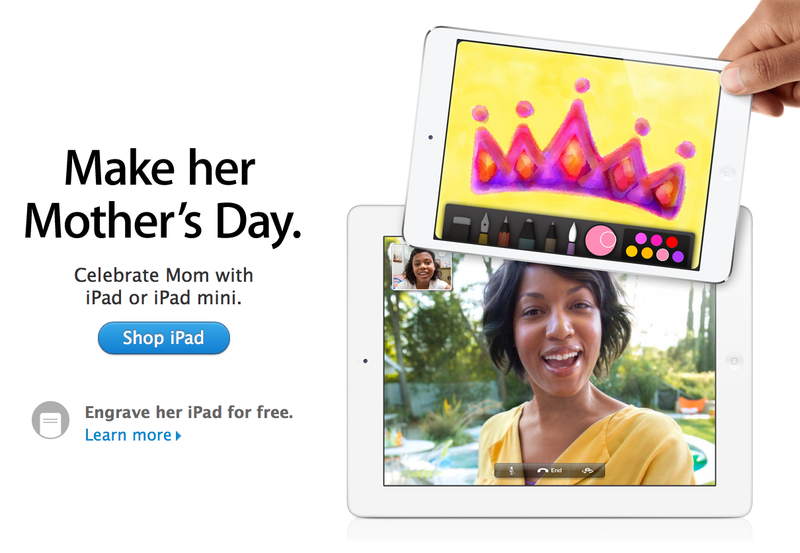 Ahead of the Mother’s Day “commercial holiday” in May, Apple has updated its online store with a Mother’s Day theme. Apple seems to be heavily promoting the iPad more than other products. Additionally, the company is promoting various accessories.